Drinking water at the correct time maximizes it’s effectiveness on the human body. Drink one or two glasses of water after waking up to help activate your internal organs. The water will help to remove any toxins before your first meal of the day. Drink one glass of water 30 minutes before a meal to help digestion. Remember not to drink too soon before or after a meal as the water will dilute the digestive juices. Drink water an hour after the meal to allow the body to absorb the nutrients. 1 glass of water before going to bed – avoids stroke of heart attack. Drink one glass of water an hour before bedtime to replenish any fluid loss that can occur during the night. 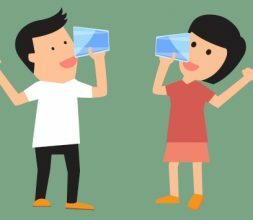 Don’t drink water during meals and don’t wait until you are thirsty, you are already dehydrated if you wait until you are thirsty to drink water.